Our newly fitted showroom is located at our Bath premises just a short distance from the city centre. You are welcome to pop by and have a look to our fantastic range of products and if you'd like to discuss your project with one of our specialists then please contact us in the following ways to book an appointment. Thank you. Our appointment system is designed to give you quality time with one of our marble and granite specialists to discuss the details of your project. 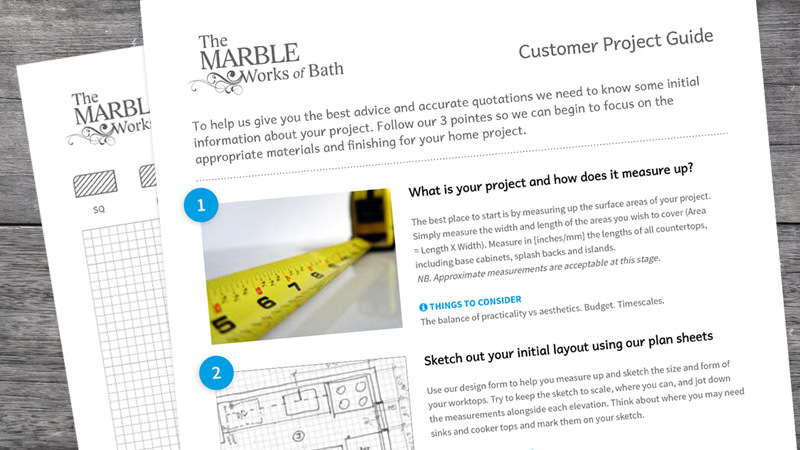 To get the most out of this appointment we encourage our customers to download our 'Customer Project Guide' to help you help us in defining the key areas of your project. Having worked with The Marble Works of Bath Ltd for a substantial period of time, we find their knowledge and passion, combined with their great customer service make them unrivalling across Bath. We often have strict time constraints to adhere to and very bespoke works. Marble Works deliver for us time and time again. Great team!